BBC NEWS | UK | Education | Why the fuss over city academies? City academies have proved controversial since they started opening in 2002. Teachers, parents - even humanists - have all been critical at one time or another. So, what are academies and why are they dividing opinion? City academies - as the name suggests - are designed to improve the performances of schools in England's inner cities, often the most deprived parts of the country. The scheme is radical: knock down the old buildings, replace them and change that most elusive of things - the school's "ethos". The theory goes that a new environment, replete with technology, will help deprived children see education as exciting and important. For some, the "ethos" has proved controversial. To become an academy, a school must raise up to £2m from private sponsors. In return, the government pays the rest of the start-up costs, typically £25m. But what amount of control does the sponsor get over the curriculum and the academy's general running? More than under the normal state system is the quick answer. Organisations such as businesses, charities, churches - and private schools - can become sponsors. These are given a majority of places on the board of governors, which runs the academy's trust. However, they still have to follow the national curriculum, which stipulates the learning of subjects like English, maths and science up to the age of 16. 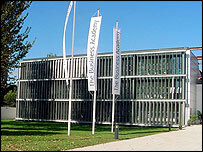 The academy trust gets ownership of the land and buildings. If an academy closes, the property reverts to the previous owner - in almost all cases, the local authority. So, academies have to offer the same subjects as other schools, but what will the freedom to direct their "ethos" mean in the classroom? In the north-east of England, the Emmanuel Foundation - set up by the evangelical multi-millionaire Sir Peter Vardy - sponsors two academies. The group has been accused of promoting a "creationist" curriculum, teaching "Christian Truth" in subjects such as maths and history. Sir Peter told the BBC this claim was an "absolute fallacy". But some parents in the Conisbrough and Denaby area of south Yorkshire, where another Emmanuel-sponsored academy was planned, said they feared "brainwashing" in lessons. They were also worried about a lack of accountability. Doncaster Council listened to their protests and decided against the Emmanuel Foundation's plan. This was the most extreme debate so far about academy sponsors' powers. The government thinks outside expertise is vital to improving inner-city schools, providing fresh ideas to go with new buildings and equipment. What form this takes, and who is involved, are key issues. Is it still "state" education in anything but name - and funding - opponents ask. Unlike other state-funded schools, city academies do not have to employ staff registered with the General Teaching Council (GTC). Of course, most will be, the government insists. It is also "clarifying" guidelines to follow when recruiting. But, the GTC argues, parents will worry about their children being "less protected" from potentially dangerous or incompetent teachers. Education unions have also been critical of academies' right to opt out of national pay agreements. Some teachers have had to sign "gagging clauses" and are afraid to question conditions, they claim. In some academies, they are having to work longer hours and perform more extra-curricular duties, the unions say. The Emmanuel Foundation's decision to install CCTV cameras in classrooms at the King's Academy in Middlesbrough also angered teachers. Unions feared they were used for spying on lessons, while the foundation said they were there to ensure staff safety and promote good discipline. The latest report by the Commons education select committee asks whether city academies are worth the extra investment. The government has pledged 200 will be open - or under construction - by 2010. At £25m a time, that equates to £5bn. MPs say there is no "coherent overarching strategy" to the investment. They found that, among the first 11 academies to be up and running, GCSE-level results had not improved at five and that some had actually got worse. The government argues that academies - of which there are still only 17 - are in their infancy and that problems faced in inner cities require years of effort. Choice of school is put forward as important in re-engaging pupils and families. The Education Secretary, Ruth Kelly, has consistently said parents must be at the heart of educational improvement. Sponsors, often successful business people, would offer an example to deprived children, to inspire them to succeed. Tony Blair's spokesman once denigrated "bog-standard comprehensives". The academies are seen as a way to rise out of the educational mire. What about the other state schools, which do not have £25m spent on them? If the target of 200 city academies is reached by 2010, they will cover a large proportion of England's inner cities. It is envisaged that they will provide a good example to others, raising standards generally. But, in a climate of intense competition among schools, keen to out-do each other in exam performance tables, is this realistic? The National Union of Teachers thinks not. Its leader, Steve Sinnott, says academies are under "enormous pressure" to succeed, given their extra funding and high political profile. The government says they must take pupils of all abilities. Mr Sinnott, though, thinks academies will seek to keep out children with poor test results or learning difficulties. Other schools will suffer as a result, he argues. As of last December, the King's and Unity City academies in Middlesbrough had expelled 61 problem pupils between them since 2002. For all other secondary schools in the borough, the figure was 15. The Department for Education and Skills denies academies will be able to "cherry-pick" pupils, calling them "local schools for local people". In a short time, they have polarised educational opinion. Only over the next few years will the true effect of city academies become apparent.